The food your cat consumes dictates its overall health, so as a cat owner, it’s your responsibility to provide the best dry cat food for your feline friend. About 60 percent of cat’s are overweight, and that’s largely due to the consumption of highly processed foods that’s present in their diet. Cats are similar to humans in that as we age, we have to pay attention to our diets. 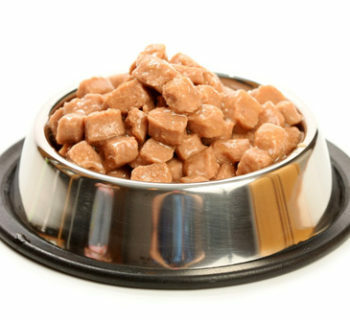 A majority of dry cat food that’s readily available and affordable causes health problems that vary from diabetes to cancer. Sometimes popular dry cat food brands can do more harm than good. 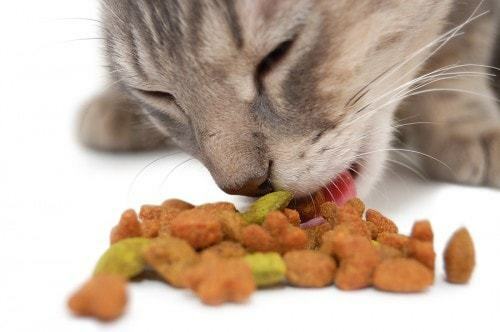 Healthy cat food brands will undergo feeding trials at the Association of American Feed Control Officials. Receiving a stamp of approval from the AAFCO means that the food contains the nutrients that the brand claims it provides. 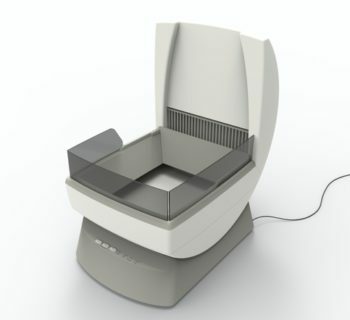 Not all pet food companies adhere to the AAFCO standard because it is extremely expensive to conduct the tests needed. As long as you make an effort to pinpoint the protein levels present in the dry cat food, you shouldn't have to worry about the food you’re feeding your cat. Ultimately, the best diet for your cat would be one that contains a combination of wet cat food and dry cat food. After comparing countless dry cat food brands, we came up with a list of the top five that stood out the most and provide detailed reviews on each one below. 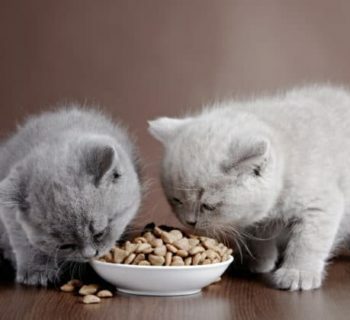 The Top Dry Cat Food to provide a healthy diet for your cat. Purina has made it a priority to shape the future of pet care and has succeeded in doing so for over 90 years. 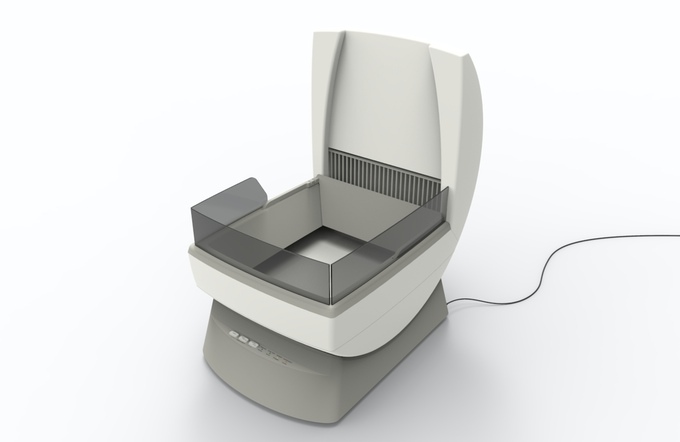 The company has invested time and money into conducting research dealing with pet nutrition, which explains why its Tender Selects Blend With Real Chicken Dry Cat Food is one of the most sought-after dry cat food. Cat owners gravitate towards this dry cat food because it is inexpensive. For less than $15, a 7-pound bag of Purina ONE Tender Selects Blend Cat Food will last a month for those with just one cat. The only way Purina could afford to sell this cat food for cheap is by including some questionable ingredients in its product. 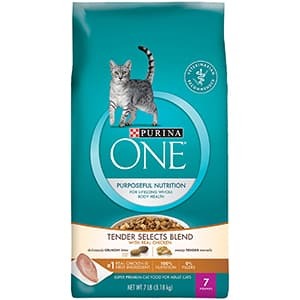 The other top ingredients listed on a bag of Purina ONE Tender Selects Blend Cat Food are bulk-adding fillers, which are not needed in your cat's diet. These ingredients are corn gluten meal, wheat flour, poultry by-product, and brewer rice. Corn is well known to be a cheap filler and most cats are allergic to wheat, so make sure to check with your veterinarian before you incorporate this dry cat food into your feline's diet. Keep in mind that all dry cat food contains some of these carbohydrates since they maintain the shape of the kibble. 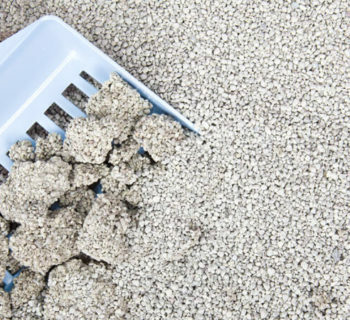 So, if your cat is allergic to a filler ingredient in dry cat food, opt-out for the wet version instead. Even with these filler ingredients, a bowl of Purina ONE Tender Selects Blend Cat Food still guarantees your cat follows a healthy and balanced diet. Your cat will benefit from the omega-6 fatty acids because they support a healthy coat and skin, while the 32 grams of protein help maintain its muscles. If you prefer to feed your cat locally grown dry food, you’ll find that the cat food from Taste of the Wild caters to your requirements. Taste of the Wild produces its food throughout the USA with a priority of ensuring high-quality ingredients. After taking a look at the Taste of the Wild Premium Dry Cat Food ingredient list, it makes sense that a five-pound bag costs around $15. 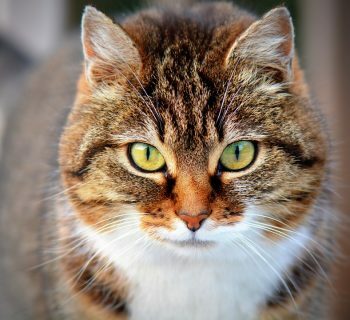 Cats adhere to a carnivore diet, so a majority of the food they consume should contain meat. 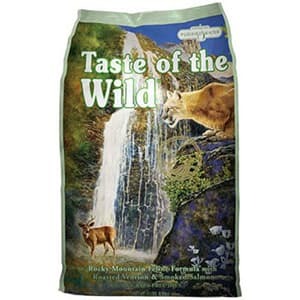 Taste of the Wild understands this which is why its Premium Dry Cat Food has a formula of real Roasted Venison & Smoked Salmon that your cat is guaranteed to devour. Chicken meal is the first ingredient on the list, which is a mixture of clean chicken meat and skin without any bones, feathers, feet, entrails, or heads. Some cat owners believe that chicken meal is a healthier alternative to plain chicken. The other four ingredients of Taste of the Wild Premium Dry Cat Food include peas, sweet potatoes, chicken fat, and pea protein. The peas and sweet potatoes are an excellent source of probiotics, which is good news for your cat's gastrointestinal tract. This dry cat food is entirely grain-free, so it's safe for cats with wheat allergies. Instead of containing fillers, corn, colors, preservatives, and artificial flavors, this dry cat food is made with sustainable fruits and vegetables. By consuming these superfoods, your cat receives all the antioxidants, vitamins, and minerals it needs to maintain a strong immune system. Blue Buffalo understands that your cat is part of your family, and the food it produces reflects this ideal. 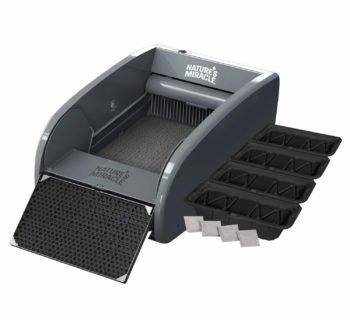 The company produces a wide range of dry cat food that targets a particular dietary issue your cat may have. 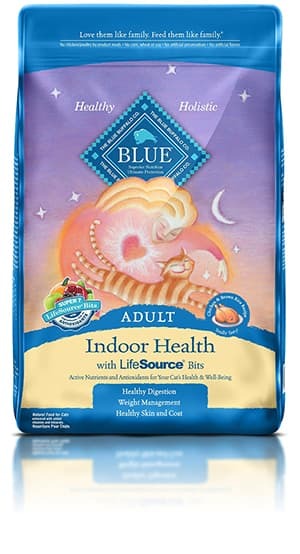 Cat owners who are looking for dry cat food that enhances the overall health of their cat should consider the Indoor Health Natural Adult Dry Cat Food from Blue Buffalo. The unique dry recipe that you’ll find in every cat food from this brand consists of a two-part food formula that combines superior natural ingredients with a blend of minerals, antioxidants, and vitamins. Blue Buffalo calls this secret recipe its LifeSource Bits, which is what separates it from the rest of the kibble on the market. Veterinarians highly recommend Blue Buffalo Indoor Health Natural Adult Dry Cat Food because the ingredients were specially selected by these animal professionals. Even the opinions of animal nutritionists were taken into account to ensure the wellbeing of your cat. Benefits of this dry cat food range from healthy muscle development to healthy eyes and heart. The primary ingredients include a mixture of deboned chicken and chicken meal, whose purpose is to ensure a proper balance of protein. Each serving of Blue Buffalo Indoor Health Natural Adult Dry Cat Food contains 34 percent protein and 3.5 percent fiber. 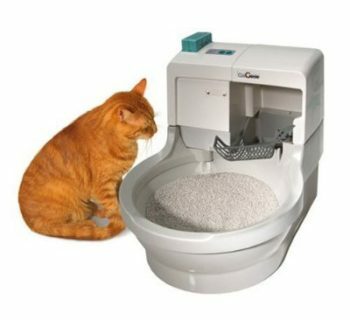 The fiber level is due to the presence of brown rice, oatmeal, and barley, which are wholesome whole grains that improve your cat’s digestive system. Thanks to the Menhaden Fish Meal present, your pet receives an adequate amount of Omega 3 and 6 Fatty Acids. The precise balance of these fatty acids promotes a lustrous coat along with healthy skin. A 15-pound bag, which should feed your cat for a month, will set you back about $30, but for all the health benefits it provides, the high price tag is worth every penny. You can opt out for the 3-pound bag to see whether or not your cat approves of the meal switch, which costs much less than the 15-pound option. Hill's Science Diet produces dry cat food that is age specific, and it relies on scientific evidence to do so. For about 80 years, this company developed its dry pet food by adhering to the expertise of over 220 pet nutritionists and veterinarians. Those opinions helped Hill's Science Diet create two lines of dry cat food, one for the cat's under the age of seven, and another for the cat's over the age 11. An indoor lifestyle takes a toll on a cat's overall well-being, especially if yours is over the age of 11. Lucky for your cat, it can defy its age with Hill's Science Diet Senior Indoor Cat Food. Your cat's youthful vitality will stay intact thanks to all the nutritional value present this dry cat food. The age-defying recipe of this Senior Indoor Cat Food contains pivotal nutrients that stem from chicken, corn gluten meal, pork fat, and wheat. 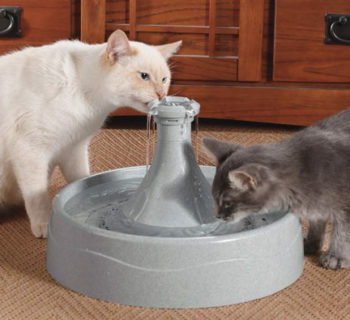 These main ingredients work simultaneously to support kidney, heart, joint, and eye health, which are common health issues amongst senior cats. 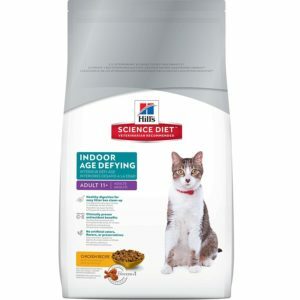 What separates Hill's Science Diet Senior Indoor Cat Food from its competitors is its clinically proven blend of fiber, antioxidants, vitamin C and E. Within a month of eating this food, your cat’s health will begin to improve. 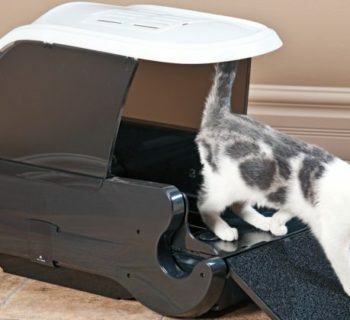 Take a look into its litter box, and you'll notice the health benefits of its diet take hold. 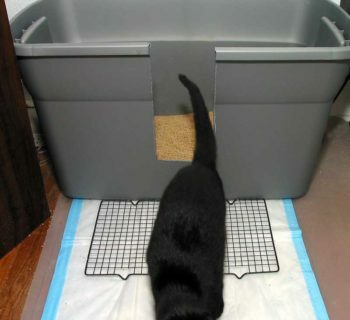 Cat owners looking to purchase the Senior Indoor Cat Food variety have the option to purchase a 3.5-pound and 7-pound bag. You won’t have to spend more than $20 on this particular dry cat food, but the same isn’t true of other Hill’s Science Diet dry cat food. 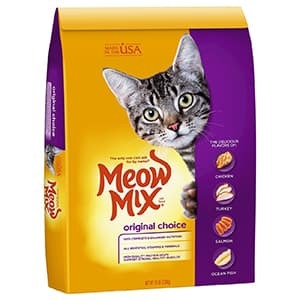 Meow Mix is the go-to brand for those who can’t afford to spend top dollar on cat food. Known for its famous advertising jingle, Meow Mix has developed a variety of wet and dry cat food that caters to the taste buds of even the pickiest cat while still ensuring the balanced nutrition it needs. Ask any cat owner about Meow Mix, and they will wholeheartedly recommend the brand. 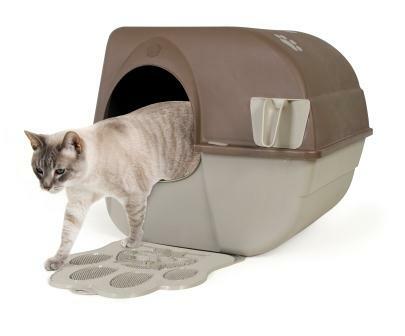 Out of all the Meow Mix cat food to choose from, the bestselling variety is the Original Choice Dry Cat Food. Your cat can effortlessly maintain a well-balanced diet with this Meow Mix Original Choice Dry Cat Food because it provides the vital minerals and vitamins a cat needs to thrive. Cat's naturally gravitate towards this Meow Mix food because each piece of kibble is a blend of turkey, salmon, ocean fish, and chicken. These flavors adhere to the diet in which cats are naturally programmed to eat in the wild, so you won't have to worry about your cat liking the food or not. Ingredients such as chicken by-product, salmon meal, soybean meal, and turkey by-product are your cat's main source of protein. The high-quality protein promotes strong muscular development in your cat, regardless of its age. A 16-pound bag of Meow Mix Original Choice Dry Cat Food costs less than $15, making it the most affordable cat food on our list. Getting your cat to switch its dry food brand will take some time. The only way to successfully change the brand is by gradually mixing the new brand with the old, so your cat familiarizes itself with the flavor. With Meow Mix Original Choice Dry Cat Food, your cat won’t resist the change since it will find the food delicious. Those who don’t mind spending a little bit of extra money can choose to purchase any of the top five best dry cat food reviewed above.